Fuel cell is an energy conversion device that converts fuel’s energy into electricity and heat by electrochemical combination of fuel with oxygen without combustion. Therefore efficiency of power generation is not limited by Carnot efficiency. Solid Oxide Fuel Cell is a type of fuel cell that has the highest efficiency of all conversion technologies in a single cycle and due to high operating temperature of SOFC’s, they are able to utilize both carbon monoxide as well as hydrogen for conversion. Also direct use of a hydrocarbon gas such as natural gas or biogas is possible due to internal reforming taking place at SOFC anodes. A fuel cell consists of three main building blocks; an anode, a cathode, and an electrolyte placed in between of them. Fuel and air are supplied to the anode and cathode side, respectively, where fuel gets electrochemically oxidized while oxygen gets reduced, creating DC current in an external circuit. In the process, water and carbon dioxide are formed as reaction products and heat is generated. 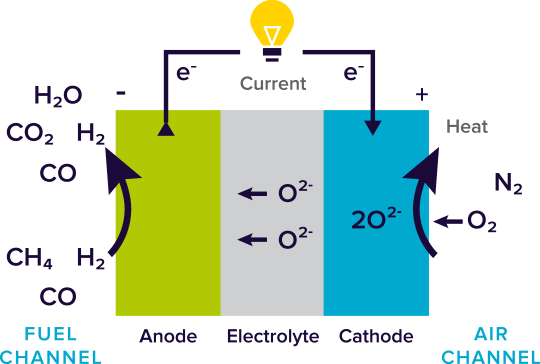 Typically fuel cells are connected in a series of cells to form a cell stack in order to obtain higher voltage for practical applications.